The significance of this picture is that it directly and indirectly represents the 3 major aspects prevalent during the Nazi occupation of Holland in regard to the Jewish community. Firstly it shows Nazi soldiers and the fear they instilled in the community even before their intentions were revealed. Secondly it shows Jewish victims, in this case young men, one of which was my mother’s cousin David Van Hasselt, lined up before being transported to their death merely for being Jewish. 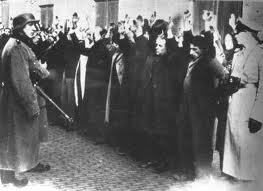 And lastly, as a result of this raid that was widely recognized throughout Jewish and Non-Jewish Amsterdam as being retaliation for something not done by a Jew, Dutch leftists organized “the February strike” (” De februaristaking”) , showing early on that the average Dutchman would not support Nazi persecution. This entry was posted on Saturday, March 10th, 2012 at 2:48 am	and tagged with Amsterdam, februaristaking, Jewish, leftists, Nazi and posted in Uncategorized. You can follow any responses to this entry through the RSS 2.0 feed.